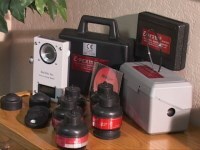 A comprehensive program describing the proper use of Electret Ion Chambers as manufactured by Rad Elec. The course consists of a video available online, a course manual describing key operational features of the EPERM system, as well as an opportunity to test your knowledge and skills in calculating results via online questions. This course provides the required educational component of the Rad Elec Manufacturer Certification Program. This course was produced in conjunction with Rad Elec for the purpose of providing EPERM users with a thorough training to obtain the most benefit from this versatile and convenient measurement system. There is approximately 4 hours of coursework, including videos, publications, and online quizzes that are taken as you progress through the course (not timed and may be taken unlimited times). There is no time limit for taking the course, and even after completion you continue to have access to the course in order to refer back to resources. Elisa said: This was a great online course! I enjoyed it! Kristofer said: The calculation portion of the course was very helpful to better understand the effects of location. David said: Very informative!! Thank You! Karla said: The course was more challenging than I thought. The class does make you think; and is very relevant to real time applications. Gary said: Very in-depth course. Very pleased with the content. Thomas said: Thanks again Doug.... It helps to have your commentary and demonstration of the devices. Francis said: The material was well presented in an easy to understand manner. Julia said: I learn a lot and feel I get all the info I need to know what I'm doing. Stephane said: The course is Very well done!